In this blog article we are discussion about MVC return types. If you are new in MVC then you should aware about all return types in MVC. 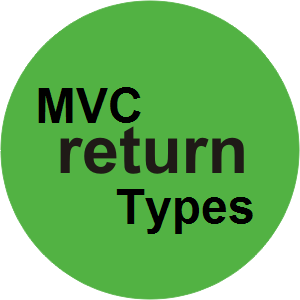 So let's discuss about MVC return types. ViewResult : Renders a specifed view to the response stream. ActionResult : you can return Json,PartialView,View,RedirectToAction. RedirectToRouteResult : Performs an HTTP redirection to a URL that is determined by the routing engine, based on given route data.